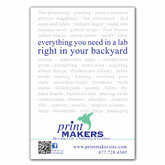 Specialty Products – Printmakers Inc. Printed on thin vinyl material. Banner width is 33″ wide and can be either 29″ 56″ or 86″ high. Banner rolls up in protective aluminum base (also available for purchase). Halogen Spotlight with clip is additional option. Perfect for trade shows, marketing specials or packages. Printed on our standard, matte, crystal or opal press papers. UV coating available on standard paper only. Come in sets of 5 identical bookmarks, printed two-sided. Order through Pro-Design (Press Products catalog —> Promo Cards). Printed on 80lb glossy paper, two-sided. UV coating and folding are optional. When designing product, keep all text and images 1/4 from all sides. Order through ProDesign, E-FTP (Press Products catalog —> Page Sizes tab). 3 different calendar types to choose from: Annual, Tent, and Monthly Hanging. Annual calendar is 11″ x 17″ size with 1 vertical image with the months running vertically down the left and right sides or with 1 horizontal image with the months running along the top and bottom. Tent calendar is a spiral bound 4.25″ x 8.5″ table top presentation with 1 photo per month edged with a black stroke. Monthly hanging calendar measures 8.5″ x 11″ closed and 11″ x 17″ opened, featuring 1 image per month with a thumbnail view of all the images on the back cover. Composites for individual months can be designed in ProDesign. Printed on a heavier version of our Standard Press Paper. Order through ProDesign (Press Products catalog—-> Calendars tab). Available in 4.25″ and 8″. Set of 4 coasters, each with a different image. 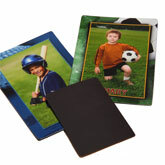 Hard glossy finish on image top and cork bottom to prevent sliding and protect table surface. Comes with a cherry wood stand to display coasters. Order through ProDesign and E-FTP (Standard Prints catalog —> Specialty Products tab). 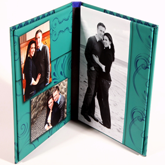 Custom photo covers are standard for DVD Cases with canvas upgrade optional. Can hold 1 or 2 DVD’s. 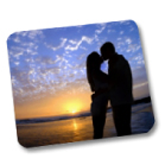 Templates for DVD cases are available in the options palette. DVD labels are printed in color directly onto DVD. Can order personalized DVD for specific client or in bulk with business logo. 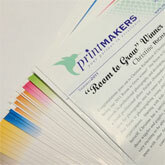 Order through ProDesign (Standard Prints catalog or Proofing catalog —> CD-DVD Products tab). Available in 5″ x 7″ and 8″ x 10″ sizes. Order through ProDesign (Standard Prints catalog —> Folios tab). Same image printed on both sides. Printed on lustre photographic paper. Wallet size comes in a quantity of 4. Order through ProDesign, E-FTP (Standard Prints catalog —> Specialty Products tab). 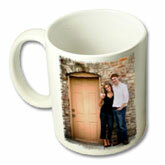 Choose to print a different image on each side or one panoramic image wrapping around the mug. Comes in a box, ready to wrap. 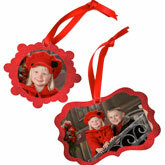 Size: 3″ x 3″ round, white porcelain ornament. Choose to have image just in the center or full out to edge. Same image appears on both sides. Comes with gold cording to hang. Available in 2 unique shapes: Snowflake (3×3) and Ornate (2.75×4 horizontal only). 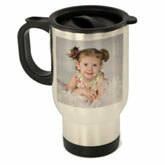 May be ordered with different images on either side, with or without borders. Drag your own image in to use as a border or select from a variety in our options palette. Comes with red ribbon for hanging purposes. Order through ProDesign or E-FTP (Standard catalog —> Specialty Products tab). Diptych, triptych, bifold, 5″ x 7″ easel back. Diptych and triptych are available in rectangular or arched. Diptych, triptych and bifold panels are hinged together. 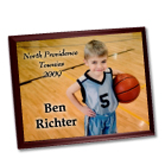 Image is sublimated into a highly durable and extremely smooth UV resistant coating. Edges and back of panel are black hardboard. Back has 2 keyholes for easy wall mounting. Order through ProDesign or E-FTP (Standard Prints catalog —> Specialty Products tab). Standard deck of cards complete with Jokers. 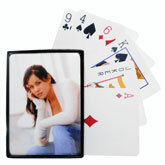 Come in box with clear top to display image on cards. Sizes: 11″ x 17″ and 12″ x 18″. Printed on 110lb. Cardstock on one side. Easy-grip handle with thumb rest. Tapered bottom fits standard cup holder. 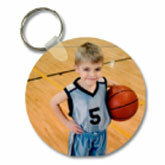 Printed directly onto material that is removable and repositionable. Comes on rectangular piece of material, cut-outs would be additional charge. Order through ProDesign, E-FTP (Proofing catalog —> File Uploads tab). 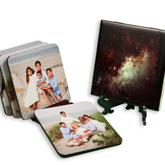 Order 8 different wallet sized images at a time (sold separately). Custom photo cover with black edge. Order through ProDesign (Standard Prints catalog —> Specialty Products tab). 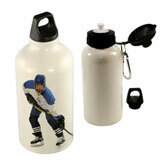 White, Aluminum 600ml water bottle. © Copyright 2019 – Printmakers Inc. – Visit us on Facebook and Instagram too!